Pan tracks 1 & 4 wide to 4 o'clock & 8 o'clock, and pan tracks 2 & 3 to 2 o'clock and 10 o'clock. You get a nice spread out "wall of sound" and you've left room in the mix for vocals to sit without being loud... ENJOY! I find since I started (2 years ago now I think), that using de-essing on my vocal tracks I get much better control over the high frequencies in the songs. It allows me to add more detail to the vocals. It also makes the reverbs in the VF less fizzy. My tip of the day: Get a de-esser! (I have a dedicated Drawmer unit but also found that my TC M1 has de-essing algorithms that work really well). I de-ess while tracking (hey, don't we do everything while tracking with the VF? ); I pull them down almost until the singer seams to be lisping and then go back a wee bit. Works wonders for the vocal presence and the reverbs. I also seam to be able to print it hotter to tape (sorry, hard-disc). Any body else using a device like this? Copy and paste a track a small fraction of a second ahead or behind the original. This will give a delay effect. It sounds like 2 different voices but it isn't. It's also an easy way to fake choral vocals. I've heard this effect on professional recordings. I don't know how it is done on analog equipment. It burns me that the designers at Fostex could do such a great job with the product and totally brain fart when it comes to the bass EQ. They somehow feel that it is okay to have one shelf control over 4.5 octaves. A third octave graphic would have dedicated 12 sliders to what Fostex gives us 1 shelf for. STUPID. Had I known how limiting this would be I would not have bought the VF-160 --- but I digress. This is how I use mine to get okay bass. You will need to buy and outboard EQ. 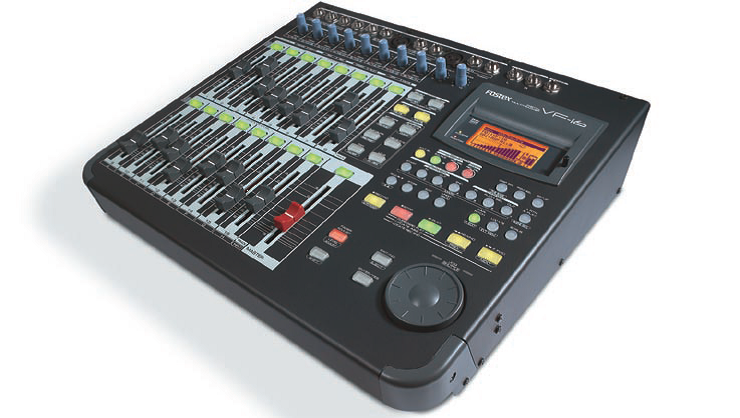 It can be a graphic, parametric or another board with EQ that was designed by a musically inclined person. Your Mackey should be fine for this duty. Wire up a pair of insert jacks for channel's 15 and 16. Common ground (sleeve) tip to send and ring to return. Insert your EQ or board into this channel. A) During recording be sure to plug the instruments you want to EQ into channel 15 or 16. I usually reserve one for bass guitar direct in and the other for the kick drum. Apply EQ and compression or whatever outboard effects you have during recording. Use the monitor to get a good sound going in. B) During mixdown or compositing I set the PRE POST aux sends to PRE, dump the channel fader and run the track out of the VF AUX send and into channel 15 or 16. This way I can EQ with the analog outboard while listening to the EQ in the mix. When I get the sound I want I re-record the track in channel 15/16 and then exchange it with the original. Controlling low end using the on-board EQ. A manuever I use to to gain some control over low end EQ is to actually use the mid EQ as more of a low control and the hi EQ as a mid corrector (I'll explain). The high EQ will sweep down as far as 500hz (the same as the mid EQ). You can adjust the Q control on the high to take it off of shelving. You can then set the bandwidth and it will function exactly the same as the mid EQ. If you then move the mid EQ down to 500hz, you can cut or boost some of the lower frequencies. Use the Q conrol on the mid EQ to reach down to the desired frequency. After you do this, use the high EQ to bring some of the upper low-mid frequencies to normal by setting the Freq. a little above the mid EQ setting and the Q narrower. Adjust the cut/boost until the more middle frequencies come somewhere near normal. The curve won't look perfect and it certainly isn't preferable to having better low EQ control, but you can achieve some level of control over the low end. It will take a bit of tweaking and re-tweaking to get what you're looking for and you will lose control of your mid and high EQ control. If you really need high and mid control also, you can always bounce the EQ'ed track over and then tweak the EQ some more with your high's and mid's free. Play around with it and try playing with the lo EQ in addition to this trick. You may suprise yourself with some good settings.